China/Brazil lead global cotton charge: USDA – Thrakika Ekkokistiria S.A.
WORLD cotton production for the 2018/19 season is forecast up slightly, led by larger crops in China, Brazil, and Australia more than offsetting lower production in Turkey and India, according to the latest report from the United States Department of Agriculture (USDA). Trade is projected up on higher imports for China and Turkey. Global cotton use is down, mainly in China and India on slower economic growth. US production is down almost 200,000 bales and consumption is reduced 100,000 bales to 3.2 million bales. The US season average farm price is lowered 2 cents to 72 cents/lbs. The USDA estimates the 2018/19 Australia cotton crop will produce 2.6 million bales (0.566 million tonnes), up 0.1 million bales from December but down 2.1 million bales, or 45 per cent, from last year. The harvested area in Australia is estimated at 0.3 million hectares, unchanged from December, but down 43pc from last year. Yield is forecast at 1.887 tonnes per hectare, 2pc below the five-year average. Yield is expected to increase from last year because of an estimated decrease in the share of the area sown to lower-yielding dryland cotton. A notable factor this season is the increase in cotton area in southern New South Wales. Early harvest results indicate irrigated yields are better than expected. The USDA says Brazil’s burgeoning production amidst greater global demand is expected to propel 2018/19 record exports even higher this month, driven by a record crop. This growth is mainly attributed to production in the states of Mato Grosso and Bahia, which combined accounted for almost 90 per cent of 2017/18’s record production. Mato Grosso has witnessed greater production during the second crop (safrina) season (the bulk of harvest is July through September), and Bahia is quickly expanding area amid strong price signals. November and December 2018 Brazil exports showed record monthly numbers. China was the primary destination as favourable Brazilian prices and high Chinese tariffs on US cotton made Brazil’s Southern Hemisphere crop an attractive alternate. With China’s imports raised to 7.5 million tonnes this month and its domestic stocks the lowest since 2010/11, Brazil is forecast to help meet this shift in demand. Continued improvement in grading and classification of Brazil’s cotton is also supporting strong interest from overseas buyers. In 2018, the country introduced the Standard Brazil High Volume Inspection (HVI) Program, aiming to better standardize classifications. Stagnant demand by Brazil’s domestic yarn and textile industry is expected to encourage future shipments amidst record supplies. The USDA estimates China’s 2018/19 cotton production at 27.5 million bales (5.99 million tonnes), up 1.9pc from December, unchanged from last year, and up 1.9pc from the five-year average. The area of cotton in China is estimated at 3.35 million hectares, unchanged from the previous estimate, but down 1.5pc from last year. Yield is estimated at a record 1.787t/ha, up 1.8pc from the previous estimate and up 1.5pc from last year’s record of 1.761t/ha. 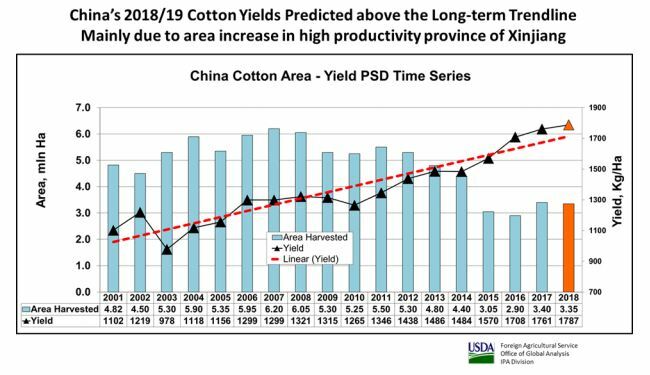 The projected yield is slightly above the long-term trend due to an increased share of cotton planted in Xinjiang province where yield is nearly twice the national average. 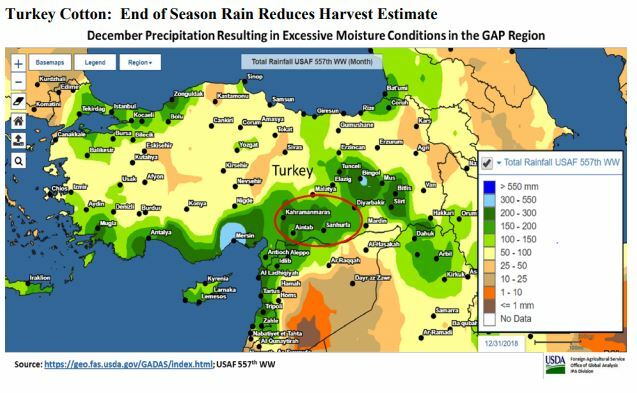 The USDA estimates 2018/19 cotton production in Turkey will be 3.7 million bales, down 0.6 million from December, and down 8pc from last year’s record. With harvest wrapping up in December, the harvested area is estimated at 520,000 hectares, unchanged from December, up 11pc from last year and up 30pc from the five-year average. Yield in Turkey is estimated at 1.549t/ha, down 14pc from December. A weak 2018 south west monsoon in India has resulted in the USDA estimating 2018/19 Indian cotton production to be 27.0 million bales, down nearly 7pc from 2017/18. The cotton area in India is estimated at 12.3 million hectares, down almost 2pc. The Indian yield is estimated at 0.480t/ha, down slightly from December and down 5pc from last year. The yield adjustment is due to the rainfall deficit and pest infestation in the major cotton producing areas of Gujarat and Maharashtra. The month-to-month change is due to lower market arrivals and lower yields. Lower arrivals indicate reduced cotton production. The below-average monsoon rainfall coupled with pest infestation truncated India’s cotton harvesting. After the first picking, trade sources reported farmers in non-irrigated areas abandoning crops in Gujarat in November.